Disabled Dog Was Sad Because No Dogs Would Play With Him. Now Watch How This Donkey Cheers Him Up. We’ve all had to go through some type of growing pains back when we were young, but a few of us had it worse than others, a lot worse. For a one year old Anatolian Shepherd named Kolina, her growing pains were literally just that. She was born with a spinal condition common in larger breed dogs that’s known as wobbler syndrome, which makes it difficult and painful for her to move. Dog’s who suffer from the disease have compressed spinal cords and sometimes the nerve roots are also compacted tightly together as well.This is what causes them to experience neurological issues and leads to stiff, painful neck aches. It also causes dogs to walk in a shaky, wobbly manner, while some of them are unable to walk at all. For Kolima, standing is a lot of work and quite painful, so she prefers to lay on her side and crouch low most of the time. Her health problems and difficulties with walking, sitting and standing, and just moving around in general, caused her further issues in terms of her social life. While most other puppies her age were romping around, chasing each other, and play fighting, Kolima had to sit out. Her wobbliness kept her from doing normal dog things and that made making new friends hard for her. However, life is not as sad and depressing as it may sound for her all thanks to Paolo, Kolima’s best friend in the whole entire world! As you can see here, Paolo is a donkey and he loves his Anatolian Shepherd friend to pieces! 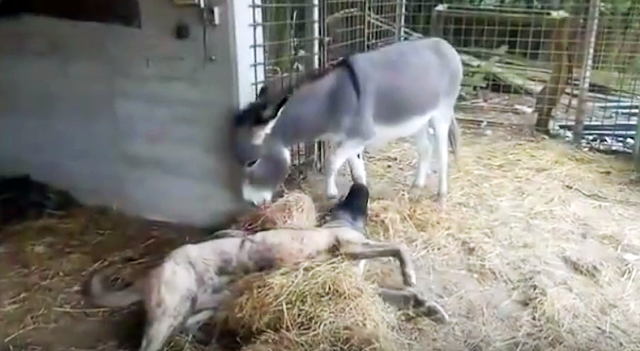 According to the pairs owner, Felice Caputo, Paolo has always been the typical donkey, which is to say he’s “mischievous and stubborn.” When the six year old donkey first met Kolina he barely glanced her way, but then when he saw that she was disabled, something in him changed. Rather than ignore or write her off, he greets her warmly and plays with her every single day now. The cute couple absolutely adore each other and when you see them play together, you’ll understand the uniquely special bond they share. It’s simply heartwarming and awesome to see, and it’s a true testament to the power of friendship.